One of the most surprising part about Recommender Systems is, ‘we summon to its suggestions / advice every other day, without even realizing that’. Confused? Let me show you some examples. Facebook, YouTube, LinkedIn are among the most used websites on Internet today. Let us see how they use recommender systems. You’ll be amazed! Similarly LinkedIn suggests you to connect with people you may know and YouTube suggests you relevant videos based on your previous browsing history. All of these are recommender systems in action. While most of the people are aware of these features, only a few know that the algorithms used behind these features are known as ‘Recommender Systems’. They ‘recommend’ personalized content on the basis of user’s past / current preference to improve the user experience. Broadly, there are two types of recommendation systems – Content Based & Collaborative filtering based. In this article, we’ll learn about content based recommendation system. Item would refer to content whose attributes are used in the recommender models. These could be movies, documents, book etc. Attribute refers to the characteristic of an item. A movie tag, words in a document are examples. 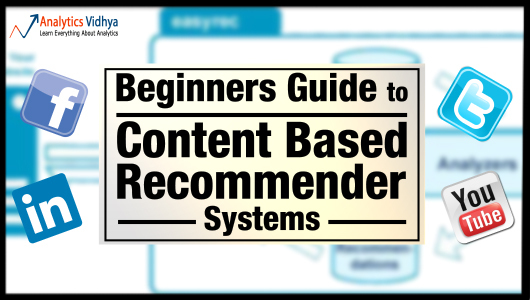 What are Content Recommender Systems? 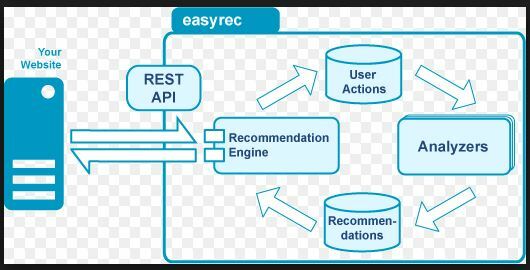 Recommender systems are active information filtering systems which personalize the information coming to a user based on his interests, relevance of the information etc. Recommender systems are used widely for recommending movies, articles, restaurants, places to visit, items to buy etc. How do Content Based Recommender Systems work? A content based recommender works with data that the user provides, either explicitly (rating) or implicitly (clicking on a link). Based on that data, a user profile is generated, which is then used to make suggestions to the user. As the user provides more inputs or takes actions on the recommendations, the engine becomes more and more accurate. What are the concepts used in Content Based Recommenders? The concepts of Term Frequency (TF) and Inverse Document Frequency (IDF) are used in information retrieval systems and also content based filtering mechanisms (such as a content based recommender). They are used to determine the relative importance of a document / article / news item / movie etc. TF is simply the frequency of a word in a document. IDF is the inverse of the document frequency among the whole corpus of documents. TF-IDF is used mainly because of two reasons: Suppose we search for “the rise of analytics” on Google. It is certain that “the” will occur more frequently than “analytics” but the relative importance of analytics is higher than the search query point of view. In such cases, TF-IDF weighting negates the effect of high frequency words in determining the importance of an item (document). It can be seen that the effect of high frequency words is dampened and these values are more comparable to each other as opposed to the original raw term frequency. After calculating TF-IDF scores, how do we determine which items are closer to each other, rather closer to the user profile? This is accomplished using the Vector Space Model which computes the proximity based on the angle between the vectors. How does Vector Space Model works? In this model, each item is stored as a vector of its attributes (which are also vectors) in an n-dimensional space and the angles between the vectors are calculated to determine the similarity between the vectors. Next, the user profile vectors are also created based on his actions on previous attributes of items and the similarity between an item and a user is also determined in a similar way. Shown above is a 2-D representation of a two attributes, Cloud & Analytics. M1 & M2 are documents. U1 & U2 are users. 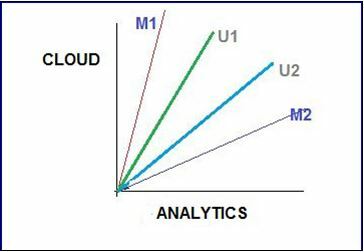 The document M2 is more about Analytics than cloud whereas M1 is more about cloud than Analytics. I am sure you want to know how the relative importance of documents are measures. Hold on, we are coming to that. User U1, likes articles on the topic ‘cloud’ more than the ones on ‘analytics’ and vice-versa for user U2. The method of calculating the user’s likes / dislikes / measures is calculated by taking the cosine of the angle between the user profile vector(Ui ) and the document vector. 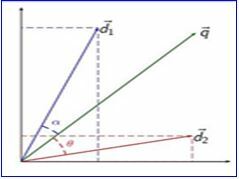 The ultimate reason behind using cosine is that the value of cosine will increase with decreasing value of the angle between which signifies more similarity. The vectors are length normalized after which they become vectors of length 1 and then the cosine calculation is simply the sum-product of vectors. We will be using the function sumproduct in excel which does the same to calculate similarities between vectors in the next section. Case study 1 – How to calculate TF – IDF ? Among the corpus of documents / blogs which are used to search for the articles, 5000 contains the word analytics, 50,000 contain data and similar count goes for other words. Let us assume that the total corpus of docs is 1 million(10^6). As seen in the image above, for article 1, the term Analytics has a TF of 1+ log1021 = 2.322. In this way, TF is calculated for other attributes of each of the articles. These values make up the attribute vector for each of the articles. IDF is calculated by taking the logarithmic inverse of the document frequency among the whole corpus of documents. So, if there are a total of 1 million documents returned by our search query and amongst those documents, ‘smart’ appears in 0.5 million documents. Thus, it’s IDF score will be: Log10 (10^6/500000) = 0.30. After we have found out the TF -IDF weights and also vector lengths, let’s normalize the vectors. Each term vector is divided by the document vector length to get the normalized vector. So, for the term ‘Analytics’ in Article 1, the normalized vector is: 2.322/3.800. Similarly all the terms in the document are normalized and as you can see (image above) each document vector now has a length of 1. 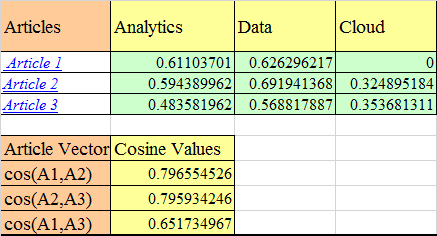 Now, that we have obtained the normalized vectors, let’s calculate the cosine values to find out the similarity between articles. For this purpose, we will take only three articles and three attributes. As you can see the articles 1 and 2 are most similar and hence appear at the top two positions of search results. Also, if you remember we had said that Article 1 (M1) is more about analytics than cloud-Analytics has a weight of 0.611 whereas cloud has 0 after length normalization. This picture is an example of movie recommender system called movielens. This is a movie recommendation site which recommends movies you should watch based on which movies you have rated and how much you have rated them. At a rudimentary level, my inputs are taken in by the system and a profile is created against the attributes which contains my likes and dislikes (may be based on some keywords / movie tags I have liked,or not done anything about). I have liked 52 movies across various genres. These items (movies) are attributes since it can help us to determine a user’s taste. Below is the list of top 6 movies recommended by movie-lens. The user columns specify whether a user has liked / disliked a recommended movie. The 1/0 simply represent whether the movie has adventure/action etc. or not. This type of representation is called a binary representation of attributes. In the above example, user 1 has liked Star Wars whereas user 2 has not. Based on these types of inputs a user profile is generated. Other metrics like count data, simple 1 / 0 representation are also used. The measure depends upon the context of use. For example: for normal movie recommender system, a simple binary representation is more useful whereas for a search query in search engine like google, a count representation might be more appropriate. Now that we have learned all these concepts, let’s actually try to build a simple content based recommender based on user taste for AV. Many articles have been published on AV. Every article published caters to a segment of audience such that some people might like articles on machine learning algorithms, while other might like R over machine learning. Hence, having a recommender system would help. We have used binary representation here. The image shown above represents, Article 1 is about big data, python and learning path. Similarly, article 2 is about R, python and machine learning. User 1 has liked article 1 (shared it on social media) and has not liked article 2. He/She has not engaged with article 3,4,5 except reading them. For binary representation, we can perform normalization by dividing the term occurrence(1/0) by the sqrt of number of attributes in the article. Hence, for Article 1: normalized attribute = 1/sqrt(3) = 0.577. A question that you must ask here is: what happened to TF? and why did we directly do normalization before calculating the TF scores? If you calculate TF without normalization, the TF scores will be 1+log 10 1 = 1 for attributes that occur and simply 0 for attributes that don’t. And, thus the TF scores will also becomes 1/0. Let’s see how the user profiles are generated by using the ‘sumproduct’ function in excel. Each attribute column (see the highlighted learning paths columns above) is multiplied with each user attribute value (highlighted part of User 2). This is simply the dot product of vectors that we saw earlier. This gives a user profile (as shown in the User Profiles part above) an understanding of user’s taste. Thus, user 1 likes articles on big data most(highest score of 1.28) followed by learning paths and then machine learning. Similarly, user 2 like articles on machine learning the most. Now we have the user profile vectors and the article vectors, let’s use these to predict which articles will be similar to the user’s taste. Note : The SUMPRODUCT function in the image above contains some vectors which are highlighted in the image. B36:F36 is the article 6 vector. The dot product of article vectors and IDF vectors gives us the weighted scores of each article.These weighted scores are again used for a dot product with the user profile vector (user 1 here). This gives a probability that the user will like a particular article. For article 1, the probability is 75%. This concept can be applied to ‘n’ articles and we can find out which article a user will like the most. Therefore, along with new articles in a week, a separate recommendation can be made to a particular user based on the articles which he hasn’t read already. Content based recommenders have their own limitations. They are not good at capturing inter-dependencies or complex behaviors. For example: I might like articles on Machine Learning, only when they include practical application along with the theory, and not just theory. This type of information cannot be captured by these recommenders. In this article, we have seen two approaches to content based recommenders. They both use the TF-IDF weighting and vector space model implementations, albeit in different ways. So while the count data helped us understand the methodology of calculating the weighted scores of articles, the binary representation helped us understand how to calculate the scores for data represented as 1/0 and we also saw how user profiles are generated and predictions are made based on that. I have intentionally left the column PredUser2 empty in case you would like to go ahead and calculate it. Did you find this article useful ? Have you also worked on recommender systems? Share your opinions / views in the comments section below. I am Shuvayan Das, a B.Tech graduate having 4 years of experience in TCS as an SQL Server Developer/DBA. I am an analytics enthusiast. I began my journey in Analytics through a course in Jigsaw. A self - learner who believes that there just isn't enough time to learn but nevertheless we gotta keep trying . I have worked on SAS/R/SQL and currently I am focused on gaining extensive knowledge and experience in Analytics because "In god we trust,all others must bring data"-W.Edwards Deming. One thing I noticed in other articles on Analytics Vidhya as well is the dominant use of masculine pronouns to indicate a generic person. I think it would look better if instead of “his interests” and “his actions” you had “his/her interests” and “his/her actions”. Thanks for bringing this up. What you mention is true. From the perspective of readability of articles, it is better to keep a single pronoun rather than both. Hence, we have just stuck to a tone / style of writing than anything else. By no means this is a reflection of any gender bias / inequality. I promise that we will switch the gender completely in some of the articles to come. Please write about collaborative filtering as well, with a similar demo. 1. Why should a movie recommender system should consider a binary representation? Can a star rating give more insight whether a customer likes or dislikes rather than a binary value? 2. How do you measure whether a user has disliked a content? Is that based on star rating again? for example, if the user rates 3 and above then the content is good and anything less the content is bad? 1.Movie recommendations are based more on ratings and reviews and tags applied to movies than a simple binary representation,though binary can also be used.I have used it just for illustration purpose. 2.You are right about the rating thing to measure user’s dislike.However generally ratings are in increments of 0.5 like 1 , 1.5 etc and I guess below 2-2.5 is a pretty bad rating on a scale of 5. Why is it that only three attributes are taken into consideration in the content recommendation study? Is there any particular reason for that? It’s a great article. Could you please explain how you calculated IDF values for your binary representation example “Building a Content based recommender for Analytics Vidhya (AV)” ? Thank you Shuvayan, that explains it. I am interested if there are examples of people using a mix of content based *AND* collaborative filtering for recommender systems. Is there anyway we can get the best of both worlds? how do I replicate in R code, Is it dotproduct(ARTICLE,IDF) then the result would be another dotproduct with UserPref? How can we choose the total corpus of documents( as in this case we took 10). Is there any way to find total corpus of documents? Can we take 13 which is the total of all the DF values? 0.6987, 0.6987, 0.5228, 0.3979, and 0.6987? how to calculate the IDF using binary encoding? BTW, why you delete my comment? In case study 1, the calculated IDF was not used anywhere. Why are you calculating it then? Why TF is not multiplying with the IDF in the first example given? hello sir i am doing my college project about recommending colleges for SEE studetns. i am thinking about using content based filtering approach can you give some idea on this topic ? The article itself mentions some examples on content based filtering and presents a walk through. If you have any problem, you can always post your questions on the discuss portal.